Offices. Total available vacancies in NVS Recruitment are 683 posts. Detailed Advertisement and online application forms available at NVS official website www.nvshq.org. Online registration of applications starts from 12-11-2017. Interested candidates have to fill the application clearly and submit through online before Last date i.e. 13-12-2017. Candidates will be shortlisted for NVS Recruitment vacancies is based on their performance in Computer Based Test (CBT). 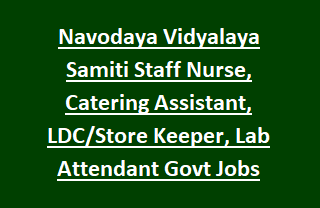 See the notification for detailed information regarding Vacancy details, Eligibility Criteria, Qualifications, Age limit, Application procedure, Application Fee of Navodaya Vidyalaya Samiti NVS Staff Nurse, Catering Assistant, LDC/Store Keeper, Lab Attendant Recruitment general notification 2017. Navodaya Vidyalaya Samiti NVS has released total 683 posts through Computer Based Test. 1. Audit Assistant: 03 posts. 2. Hindi Translator: 05 posts. 4. Lower Division Clerk LDC: 10 posts. 1. Female Staff Nurse: 81 posts. 2. Catering Assistant: 61 posts. 3. LDC/ Storekeeper: 440 posts. 4. Lab Attendant: 77 posts. Maximum age limit for Audit Assistant, Hindi Translator, Lab Assistant is 18 years to 30 years. For Catering Assistant, Staff Nurse is 35 years. For Lower Division Clerk, Stenographer is 18 years to 27 years. Staff Nurse: Senior Secondary Examination or Equivalent and 3 years Diploma in Nursing from recognized Institute. (OR) BSC Nursing with 2 years practical experience in Hospital/ Clinic. Catering Assistant: 10th class pass and 3 years Diploma course in Catering (OR) Senior Secondary from CBSE with Hotel Management & Catering as Vocational subject (OR) Senior Secondary Examination with one year Diploma in Catering from recognized Institution. See the NVS Notification for more details. Mode of selection for NVS Jobs is based on the candidate performance in Computer Based Test/ Skill Test. For Stenographer, Lower Division Clerk LDC/ Storekeeper vacancy final selection will be based on Computer Based Test followed by Skill test. Online Computer Based Test consists of 100 multiple Choice Questions. Total marks are 100 and the time duration is 150 minutes. No Application fee for SC/ST/ PH/ Ex-serviceman. Online application forms available from the Navodaya Vidyalaya Samiti official website http://nvshq.org. Interested candidates fulfilling all eligibility criteria can send the NVS applications through online from 12-11-2017 to 13-12-2017.